NASA's Terra satellite captured this image of smoke billowing off the Camp Fire in Northern California on Nov. 14, 2018. The late-season Camp wildfire is still raging across Northern California, but firefighters are gradually corralling the Woolsey Fire, which has burned swaths of Southern California. According to CBS News, the Camp Fire has left 56 dead, with more than 100 people missing. California's fire bureau reports that the fire is currently 35 percent contained and has burned 138,000 acres (560 square kilometers). In Southern California, firefighters are making more headway; the Woolsey blaze is currently 57 percent contained, although it has burned more than 98,000 acres (400 square kilometers). NASA personnel are also setting to work mapping the damage caused by that blaze. 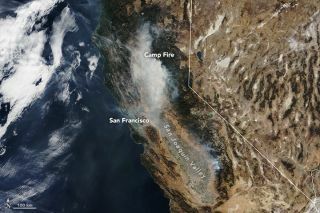 By comparing and contrasting radar images gathered by satellites before and during the fire, a team based at the agency's Jet Propulsion Laboratory has created a map showing where the surface of the Earth has changed. The researchers have shared that map with emergency responders and disaster personnel. And it's not just scars from the recent fires that satellites can see; even last year's fires are still leaving their mark on the Earth. In these satellite images, the Woolsey burn scar is particularly obvious in the pinkish spot. But to the northwest, a large patch of tannish area marks where the Thomas Fire burned last December.